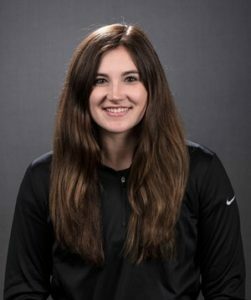 University of Iowa senior Megan Gustafson has been named the Big Ten Player of the Week, the conference office announced Monday. It is her fifth honor of the season and the 15th of her career. Gustafson netted a game-high 28 points and pulled down 12 rebounds to lead the Hawkeyes to an 83-57 victory over Northern Iowa on Dec. 16. She shot 79 percent from the field and 86 percent (6-for-7) from the free throw line. Gustafson also added an assist and a block in the victory. The Port Wing, Wisconsin, native has 2,050 career points. She needs 53 points to become Iowa’s all-time leading scorer. Ally Disterhoft holds the record of 2,102 points (2013-17). Gustafson became Iowa’s career rebounding leader on Dec. 5. She has 1,102 career rebounds. Gustafson broke a Big Ten single-season record last season with nine Player of the Week honors. She was also named to the conference’s weekly honor roll six times. Gustafson and the No. 16/15 Hawkeyes return to action on Friday, Dec. 21, traveling to Drake. Tipoff is at 6 p.m. (CT) at the Knapp Center.